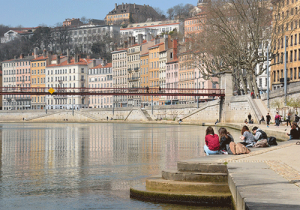 Perhaps no city will be more memorable than Lyon as one of your ports of call on any south of France river cruise that sails the Saone or Rhone rivers. From river bank to the rising hillsides beyond, the pastel colors and architecture of its buildings portray a place of history, beauty, culture and refinement, tempting one to explore and breathe deeply of its relaxed atmosphere. 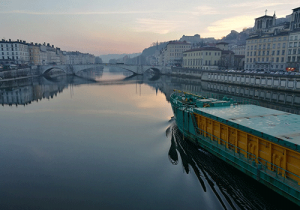 Lyon sits at the convergence of the Saone and the Rhone rivers, an ancient settlement – perhaps older than even Paris – so it is not unusual to find it is honored with one of UNESCO’s World Heritage sites in its old quarter, Vieux Lyon. The city has grown over the centuries to encompass nine different such areas each beautifully situated near one of the rivers or on the hillsides. It is hard to believe it is the second, some say third, largest city in France so quiet, so clean, so sophisticated its presence. 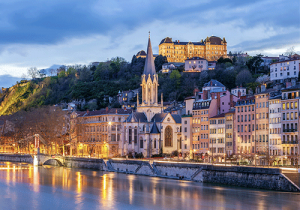 Lyon boasts over 2000 restaurants, and 20 Michelin stars. It has museums such as a Textile Museum ( Lyon was once a center for the production and weaving of silk), a Decorative Arts Museum, a museum celebrating the Marionette (puppet), and also a Museum of Miniatures and Cinema. Its buildings reflect old world Renaissance architecture from the civic government structures to its churches, to its opera house. This city invites the visitor to stroll the gracious, some winding, and some narrow, streets; shop the famous designer names in its boutiques; savour the wine in its cafes (Lyon is in the heart of the wine growing Beaujolais region); sample the famous silk weaver breakfast in a bouchon; or dine at a Michelin-starred restaurant; marvel at the 150 plus trompe l’oeil works of art scattered on walls throughout the city; and relax to an evening of opera or ballet. There’s lots to do in Lyon. Oh, and if you are there between December 8th and 12th, you will see why it is called the City of Lights. Legend has it that years ago after the city was spared the worst of a plague due to the intervention of the Virgin Mary, a statue was erected to her while every window in the city held a lit candle in her praise. This tradition eventually became the modern light festival of today . Artists from around the world transform this elegant city into a city ablaze with their original creations set to music, sound effects, and videos. Feature photos courtesy of Pixabay .